I love to knit. I'm fairly horrible at it, but I still love it! I can make squares and rectangles - nothing too fancy. I even kind of taught myself how to switch colors (although, now that I think about it, that scarf is still sitting in my closet, two years unfinished). Unfortunately, I don't do it right. The person who taught me didn't know how to teach it very well (not their fault - they were right handed, I'm a lefty which is a no-bueno combination) so I'm not a very swifty knitter. I pick it up about once a year usually to knit a scarf. Every time I start again, I feel a little rusty and I always forget how to cast on (aka begin). I always go back to this tutorial. It has served me well for the last eight years. I already had some white yarn lying around (I used Homespun acrylic yarn in Hepplewhite). I cast on 15 stitches using size 11 needles. Then I knitted, and knitted, and knitted until I got my desired length. Once it was fairly long, I folded it in half and held it up to the infinity scarf I already owned and then kept going until it was similar in length. It ended up being about six feet long. To make it an infinity scarf, I just took white thread and sewed the ends together. Simple as that! Here it is wrapped around three times. Sorry about the awkward pictures. My professional photographer was off that day. I like the difference between twice and three times. Here it is just twice. As much as I like knitting, I think my next goal is to learn how to crochet! I've heard that if you can crochet, you can't knit and if you can knit, you can't crochet. Since I'm a pretty bad knitter, I should be pretty awesome at crocheting! Right?! Good timing with your cute scarf and the big snow we're getting. 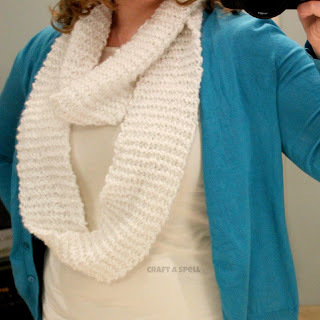 I love to crochet because it's easier to "fudge" with crochet than with knitting. Yeah, I've been known to drop a stitch while knitting and not realize it for a long time. I want to learn to crochet! Hi Dianna! I just found your site after reading Susan's blog where you had a guest post! I am glad to meet you. I live in Fredericksburg, VA and I didn't know all of the things you shared in her post! Of course, I have only been here for over a year! I love your crafts and recipes and would love it if you would pop over and share them at my In and Out of the Kitchen link party. Susan shared your guest post there! The party is for crafts, recipes and DIY projects. The party ends tonight, so there is still time to show off some of your craftiness! So lovely!I love how it turned out.Love the color too.Thanks so much for sharing. Would love to have you visit me sometime. 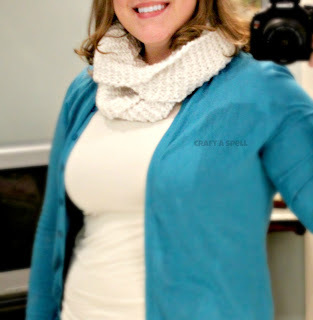 Thanks so much for linking up with us at "In and out of the Kitchen Link Up Party", cute scarf. I can't knit but can crochet. We're on opposite sides then, Dawn! I hope to crochet sometime this year! So cute. I love infinity scarves, and this one is so cute. I will be featuring this on my party highlights post for the week. Thanks so much for linking up! i love infinity scraves, and the color you chose, it will go with everything. Thank you for linking up at Fluster's Creative Muster. Hope to see you next week! Thanks, Robin! I love the color too! Great gift idea for my office friends. Thanks. In regard to if you can knit you can't crochet and if you can crochet you can't knit, SO NOT true. My mother can do both extremely well. It has to do with practice, practice and more practice, that all! Looks nice...Think I will try it...and fyi, I knit and crochet so it is possible to do both!